Workshop on “When Was Linearity? What Graphics Mean in the Digital Age.” Center for the Arts in Society, Carnegie Mellon University. 17 September 2010. “Remembering Networks: Agrippa, RoSE, and Network Archaeology.” Center for the Arts in Society, Carnegie Mellon University. 16 September 2010. Abstract: In 1992, at the onset of the digitally networked aged, publisher Kevin Begos, Jr., artist Dennis Ashbaugh, and novelist William Gibson issued their collaborative artist book Agrippa (a book of the dead), whose last pages contained a self-encrypting, “vanishing” poem on a diskette. The poem immediately went viral on the networks and clinched Agrippa’s status as a prototypical networked book or “book that became a network.” Basing his talk on Agrippa as well as on The Agrippa Files site that he and graduate students built to document the book’s media and contexts, Alan Liu speculates on how a “network archaeology” might be possible that extends the scholarly approaches of “media archaeology” and “the history of the book” to past works that are networked. Liu will conclude with a presentation of the RoSE (Research-oriented Social Environment) online system that the Transliteracies Project he directs created to capture networks of past writers, readers, and works through present social-network technologies. Interview by David Miller, Director, Center for Digital Humanities, University of South Carolina. 10 September 2010. 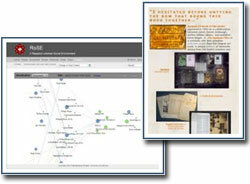 “From Reading to Social Computing.” Center for Digital Humanities, University of South Carolina. 9 September 2010.